I was on the phone with Adam and interrupted him because I noticed a commercial that switched fonts from Helvetica Bold in the middle of the spot to Arial Bold in the closing frames. The fonts are so similar that they really shouldn’t have switched. It was probably an oversight, but I was startled by it. Anyway, Adam commented that it’s crazy I noticed the difference. So, here’s an image to show why it isn’t crazy to notice the difference between the two. 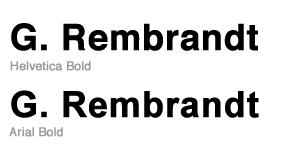 Comparison of Helvetica vs Arial. Note the capital G, R, and lowercase e, r, a, and t.
The giveaway for me is the capital letter R. Helvetica’s capital R has some nice curves on the leg of the R, compared to Arial’s fairly angular stroke. I really like Helvetica’s.